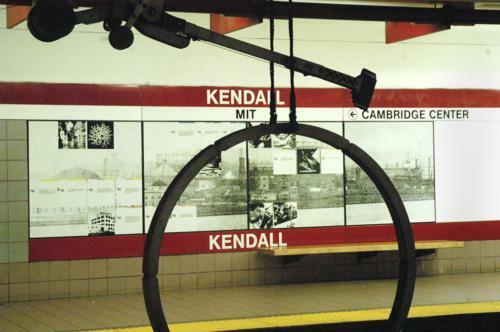 A member of the Kendall Band, a series of bells and mallets, in the MBTA Kendall Square stop. These bells, which can be played by commuters, were installed 22 years ago and demonstrate theories taught in introductory physics. Commuters who wait at the Kendall Square T-stop have an aural distraction that is unlike amateur subway guitarists or the tunes emanating from their iPod earbuds. Since 1984, a contraption that melds high-culture art, physics, and the grime and tumult of Boston’s mass transit has amused and frustrated subway riders. The bells and mallets that form the Kendall Band demonstrate theories taught in introductory physics, a course you wouldn’t normally associate with the contraption’s creator, Paul H. Matisse ’54, grandson of famed artist Henri Matisse. Matisse came up with the idea 22 years ago, when the Cambridge Arts Council and the MBTA asked him to beautify the Red Line station, which was in decline, as part of a subway expansion project. The Kendall Square Band, as the set of instruments is called, cost $90,000 to build and consists of three pieces with names befitting their location by MIT: Pythagoras, a series of chimes; Kepler, a ring-shaped gong; and Galileo, a vibrating sheet of metal. Holton says that he remembers Matisse clearly, even though 300 students took the course. “He was human and skill put together,” he says. Thirty years later, after becoming a sculptor and inventor, Matisse cracked open his freshman physics textbook again to teach himself how to build a better bell. While each of the three apparatuses can be played by any commuter who can pull a lever, this task can prove quite difficult for the unsuspecting and impossible when wires connecting the operating levers to the bells are broken. In fact, it was not meant to be a test, according to Matisse. “I don’t test anybody,” he says. “I usually like to present them with something that I really like, that I think is beautiful,” the artist said. Matisse explains that when a typical metal bar is struck and vibrates, several points on the bar—called “nodes” by physicists—do not vibrate, but produce two tunes that resonate from each bar. Matisse sawed nicks at these nodes on the bar so that the whole bar would be more flexible, setting the two tones a full octave apart and eliminating the discord. The gong, called Kepler, is now broken but produced sound when a hammer hit its metal disc. The third instrument—dubbed Galieo—is a metal sheet that makes a loud, thunderous noise, sometimes irking commuters, when the handle is moved. “I don’t like the sheet that sounds like a train because I always think a train is coming, but it’s not,” says Gita Manktala of the MIT Press, a frequent commuter through the Kendall station. After a few minutes of trying the instruments, one realizes that slower is better. Jerk too hard on Pythagoras’ handle, and the bells don’t sound. But play them slowly and rhythmically and they spring to life. In fact, within a certain range of speeds, each speed produces a different tone. In the first months after its installation, the Pythagoras bells would frequently break when frustrated riders would yank too hard on the handle. Matisse, who was in charge of fixing the bells, recalls leaving notes on the handle explaining the problem. Matisse’s subway soundmakers, says Holton, are “a very humanistic idea” that try “to intersperse...the very pedestrian day-to-day existence of someone waiting on a platform” with scientific phenomena. Matisse says he has found the bevy of positive responses in the past two decades very fulfilling. He says he remembers one such experience several years ago when he was waiting for the last train of the night to leave before he began repairing his invention. “On the other side of the tracks was a guy, very large, who had decked himself out to be as threatening as possible,” Matisse says, recalling that moment. “I was across two third-rails, and I was glad of that,” he says. According to Matisse, the man called out to him across the tracks. “‘Are you Paul?’” he asked. “‘I don’t know if anyone has told you this, but thank you,’” the man said. Then the last Red Line train rumbled into the station and the man rode off into the night.